Akasagarbha Bodhisattva (Chinese: 虛空藏菩薩) is one of the eight great bodhisattvas. His name can be translated as «boundless space treasury,» as his wisdom is boundless as space itself. In Japan he is known as Kokuzo. 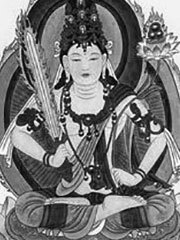 Kukai (Kobo Daishi), the founder of Shingon Buddhism, is said to have chanted a mantra of Akasagarbha Bodhisattva that enhanced his wisdom and memory.